The majority of today’s brand-centric social media conversations are revolving around beverage, technology, and restaurant brands. These findings come from a new monthly report tracking the social media conversations involving the top 100 consumer brands. The report is a joint effort between uberVU, a social media audience measurement firm, and PQ Media, an economic forecaster and tracker for the media industry. MediaPost.com reported on why a few global brands are dictating the dialogue of social media. 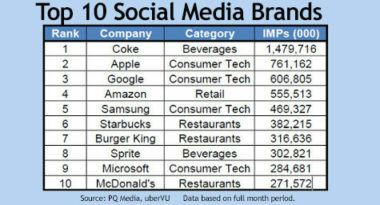 For the month of the July, the report named Coca-Cola as the brand with the highest number of social media impressions. The beverage giant generated twice as many social impressions as the second-ranked brand, Apple. In fact, Coke earned 1.48 billion impressions during that month-long span, which was almost 14 percent of the 10.6 billion impressions received by the top 100 consumer brands overall. The third-ranked brand was Google, followed by Amazon and Samsung. Interestingly, the U.S. only delivered 44 percent of total social media impressions in July, despite comprising almost one-half of global ad spending. On an individual brand basis, Coke actually generated 87 percent of its social media impressions and Apple received more than 70 percent of its impressions from outside the U.S. While the report didn’t differentiate between “paid” and “owned” impressions or account for elements like seasonality, it did demonstrate how the top-ranked brands generated an overwhelming share of total social media impressions and also shed light on the overall global nature of these highly valuable social impressions. To discover how to increase your social media impressions, contact MDG Advertising. At MDG, our 360° marketing approach uses just the right mix of traditional and online media to reach your brand’s marketing goals. While some industries may fare better in print and others online, we strive to create a balanced approach where digital and traditional advertising efforts support each other and your marketing message is tailored to the medium. To stay on top of the latest social media marketing trends that will make an impact for your brand, contact MDG Advertising.